For a couple of years now I have been using Mathematica as my programming language of choice for my digital history work. For one thing, I love working with notebooks, which allow me to mix prose, citations, live data, executable code, manipulable simulations and other elements in a single document. I also love the generality of Mathematica. For any kind of technical work, there is usually a well-developed body of theory that is expressed in objects drawn from some branch of mathematics. Chances are, Mathematica already has a large number of high-level functions for working with those mathematical objects. The Mathematica documentation is excellent, if necessarily sprawling, since there are literally thousands of commands. The challenge is usually to find the commands that you need to solve a given problem. Since few Mathematica programmers seem to be working historians or humanists dealing with textual sources, it can be difficult to figure out where to begin. As a sample text, we will use the Darwin’s Origin of Species from Mathematica‘s built-in example database. The Short command shows a small piece of something large. Here we’re asking to see the two lines at the beginning and end of this text. INTRODUCTION. When on board H.M.S. ... have been, and are being, evolved. The Head command tells us what something is. Our text is currently a string, an ordered sequence of characters. Suppose we want to work with part of the text. We can extract the Introduction of Origin by pulling out everything between “INTRODUCTION” and “CHAPTER 1”. The command that we use to extract part of a string is called StringCases. Once we have extracted the Introduction, we want to check to make sure that the command worked the way we expected. Rather than look at the whole text right now, we can use the Short command to show us about five line of the text. It returns a couple of phrases at the beginning and end, using ellipses to indicate the much larger portion which we are not seeing. It will be easier for us to analyze the text if we turn it into a list of words. In order to eliminate punctuation, I am going to get rid of everything that is not a word character. Note that doing things this way turns the abbreviation “H.M.S.” into three separate words. Mathematica has a number of commands for selecting elements from lists. The Take command allows us to extract a given number of items from the beginning of a list. The First command returns the first item in a list, and the Rest command returns everything but the first element. The Last command returns the last item. We can also use an index to pull out list elements. We can test whether or not a given item is a member of a list with the MemberQ command. If we want to apply some kind of function to every element in a list, the most natural way to accomplish this in Mathematica is with the Map command. Here we show three examples using the first 40 words of the Introduction. Note that Map returns a new list rather than altering the original one. In order to compute word frequencies, we first convert all words to lowercase, the sort them and count how often each appears using the Tally command. This gives us a list of lists, where each of the smaller lists contains a single word and its frequency. The Cases statement pulls every item from a list that matches a pattern. Here we are looking to see how often the word “modification” appears. Most programming languages let you define new functions, and Mathematica is no exception. You can use these new functions with built-in commands like Map. reuse and share code: so you don’t have to keep reinventing the wheel. In Mathematica, you can also create anonymous functions. One way of writing an anonymous function in Mathematica is to use a Slot in place of a variable. So we don’t have to define our function in advance, we can just write it where we need it. We can apply an anonymous function to an argument like this, and Mathematica will return the number 42. A named function like plus2 is still sitting there when we’re done with it. An anonymous function disappears immediately after use. The Partition command can be used to create n-grams. This tells Mathematica to give us all of the partitions of a list that are two elements long and that are offset by one. We can tally and sort bigrams, too. A concordance shows keywords in the context of surrounding words. We can make one of these quite easily if we starting by generating n-grams. Then we use Cases to pull out all of the 5-grams in the Introduction that have “organic” as the middle word (for example), and format the output with the TableForm command. Mathematica has access to a lot of built-in, curated data. Here we grab a list of English stopwords. The Select command allows us to use a function to pull items from a list. We want everything that is not a member of the list of stop words. Here is a more complicated example built mostly from functions we’ve already seen. We start by finding the ten most frequently occuring words once we have gotten rid of stop words. We remove a few of the words we are not interested in, then we rewrite the bigrams as a list of graph edges. 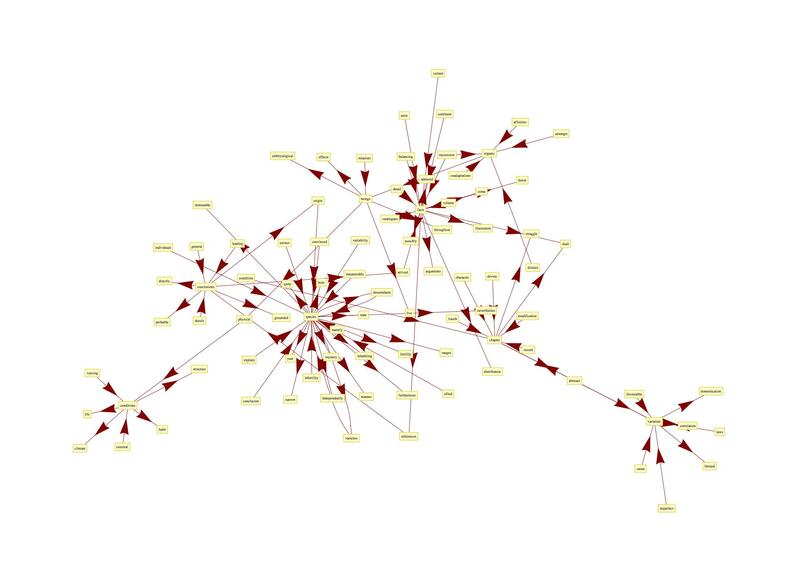 This will be useful for visualizing the results as a network. We grab the most frequent ones. Finally we can visualize the results as a network. When you are exploring a text this way, you often want to keep tweaking your parameters and see if anything interesting comes up. We have been looking at the Introduction to Origin. We can also calculate word frequencies for the whole document. When we list the fifty most common words (not including stop words) we can get a better sense of what the whole book is about. A word that occurs frequently on every page doesn’t tell you anything special about that page. It is a stop word. A word that occurs only a few times in the whole document or corpus can be ignored. A word that occurs a number of times on one page but is relatively rare in the document or corpus overall can give you some idea what the page is about. Using document frequencies and TF-IDF we can get a sense of what different parts of a text are about. Here is how we would analyze chapter 9 (there are 15 chapters in all). formations. On the absence of intermediate varieties in any one formation. in the lowest known fossiliferous strata. In September, Tim Hitchcock and I had a chance to meet with Adam Farquhar at the British Library to talk about potential collaborative research projects. Adam suggested that we might do something with a collection of about 25,000 E-books. Although I haven’t had much time yet to work with the sources, one of the things that I am interested in is using techniques from image processing and computer vision to supplement text mining. As an initial project, I decided to see if I could find a way to automatically extract images from the collection. My first thought was that I might be able to identify text based on its horizontal and vertical correlation. Parts of the image that were not text would then be whitespace, illustration or marginalia. (One way to do this in Mathematica is to use the ImageCooccurence function). As I was trying to figure out the details, however, I realized that a much simpler approach might work. Since the method seems promising I decided to share it so that other people might get some use out of it (or suggest improvements). In a British Library E-book, each page has a JPEG page image and an associated ALTO (XML) file which contains the OCRed text. The basic idea is to compare the JPEG image file size with the ALTO file size for the same page. Pages that have a lot of text (and no images) should have large ALTO files relative to the size of the JPEG. Pages with an image but little or no text should have a large JPEG relative to the size of the ALTO file. Blank pages should have relatively small JPEG and ALTO files. The graph below shows the results for an E-book chosen at random from the sample. Textual pages cluster, pages with images tend to cluster, and blank pages (and covers) fall out along one axis because they have no text at all. We can use more sophisticated image processing and machine learning to further subdivide images and extract them once they are located, but this seems pretty good for a first pass. 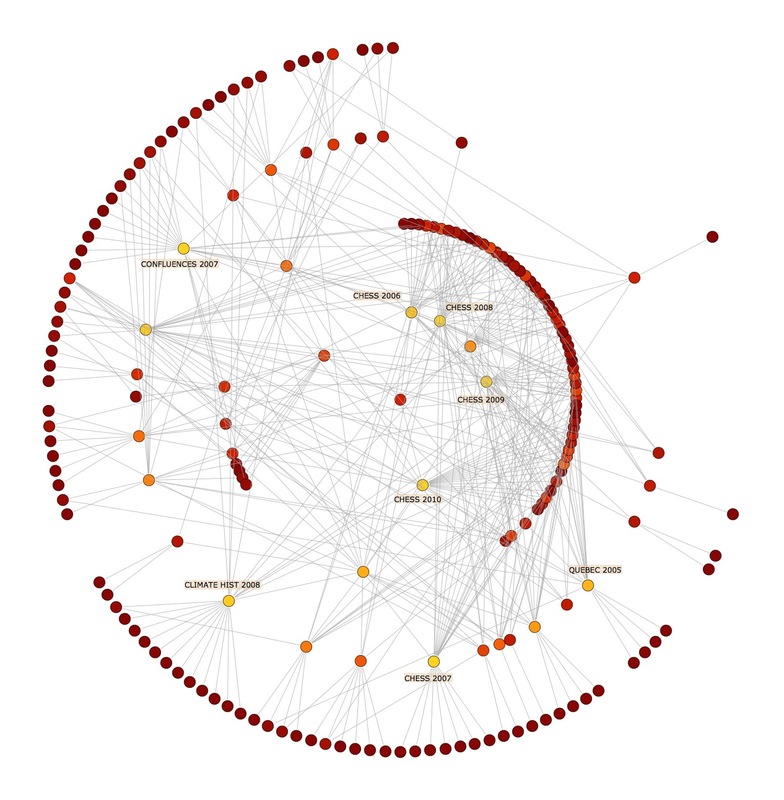 In April 2008, I posted an article in my blog Digital History Hacks about visualizing the social network of NiCHE: Network in Canadian History & Environment as it was forming. We now use custom programs written in Mathematica to explore and visualize the activities of NiCHE members, and to assess our online communication strategies. Some of the data comes from our online directory, where members can contribute information about their research interests and activities. Some of it comes from our website server logs, and some of it is scraped from social networking sites like Twitter. A handful of examples are presented here, but the possibilities for this kind of analysis are nearly unbounded. When NiCHE members add their information to our online directory, they are encouraged to select one or more of a set of research interests. This heat map shows the degree of overlap for each pair of topics, with brighter colours indicating a greater number of people who indicated an interest in both areas. Some of the pairings are not surprising: people who are interested in landscape are often interested in conservation, environmentalism and parks, and vice versa. The absence of overlap is also meaningful. People who are interested in fisheries seem not to be interested in landscape, and vice versa. Why not? A workshop that tried to bring both groups together to search for common ground might lead to new insights. Studying visualizations like this one also allow us to assess the extent to which our original thematic projects (focusing on Landscapes, Forest History, Water, etc.) actually cover the interests of members. Some of the members of the NiCHE executive do research in the history and philosophy of science, and this is apparently something that many NiCHE members are also interested in. A future workshop to address this interest might be co-hosted by NiCHE and the Situating Science knowledge cluster. Looking at the same information in a different way brings new things to light. 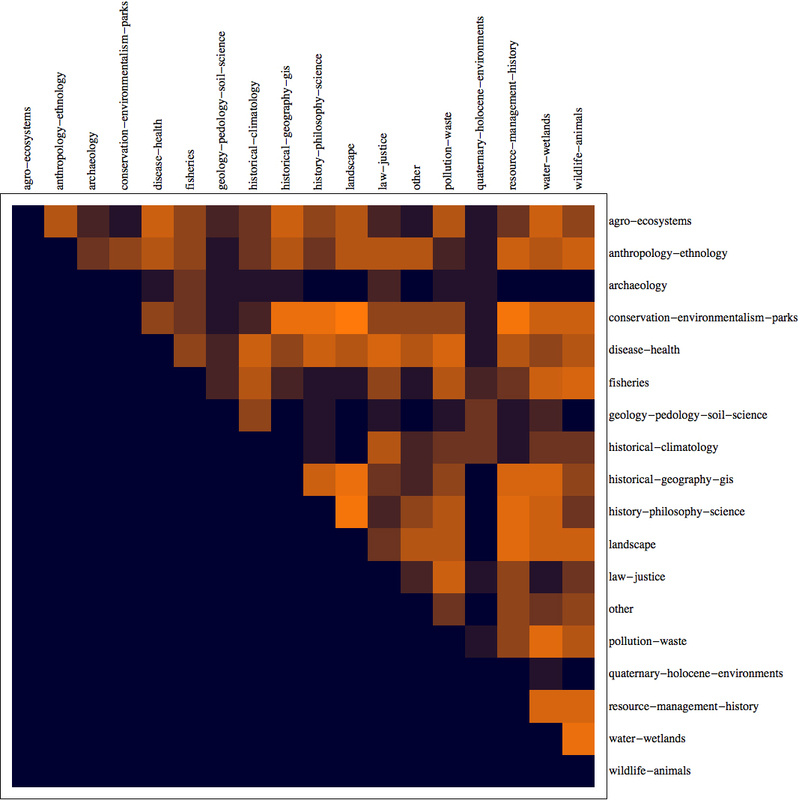 This figure shows the degree of overlap between pairs of research interests as a graph rather than a heat map. Research topics are represented as vertices, and the size of the edge connecting each pair indicates the degree of overlap. This graph suggests that NiCHE members who are interested in subjects that focus on material evidence over very long temporal durations are relatively marginal in the knowledge cluster, and may not be well connected even with one another. Again, being able to visualize the data gives us the possibility of addressing the situation. Perhaps we should make more outreach to geologists and archaeologists? Studies of social networks suggest that their “small world” properties are typically due to people who provide bridges between interest groups or make other kinds of long-distance connections. 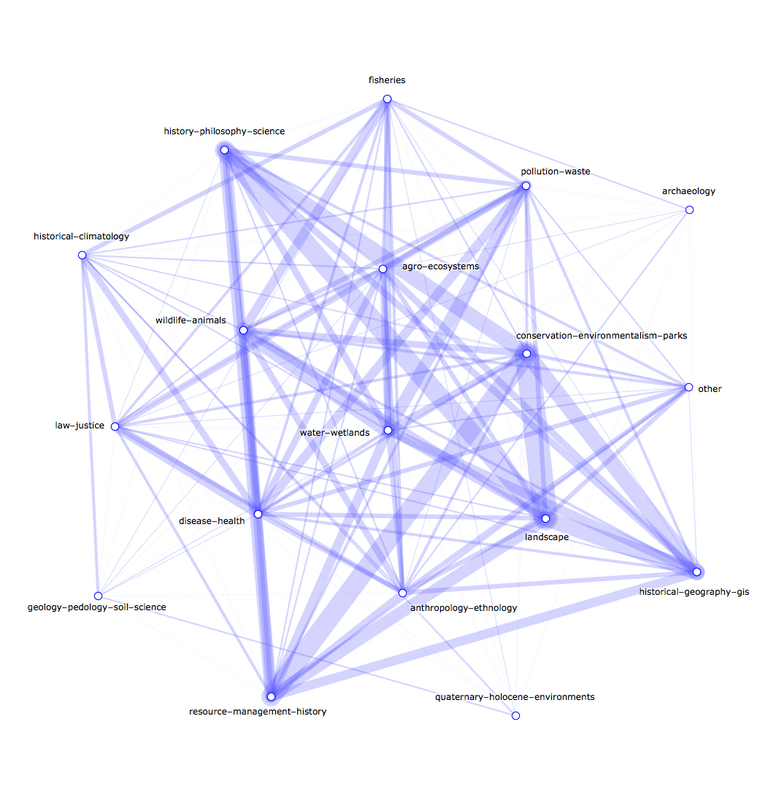 Here we use a graph to visualize every pair of research topics that are of interest to a single NiCHE member. From this figure it is easy to see that Darin Kinsey is the only person who has claimed to be interested in both landscapes and fisheries. If we did decide to hold a workshop on the intersection of those two topics, he might be the ideal person to help organize it. If we want to try to get scholars talking to one another across methodological or thematic boundaries, then we should enlist the help of people like Ravi Ranganathan, Norm Catto and Liza Piper to get the conversation started. Our online directory also allows NiCHE members to indicate which activities they have participated in. 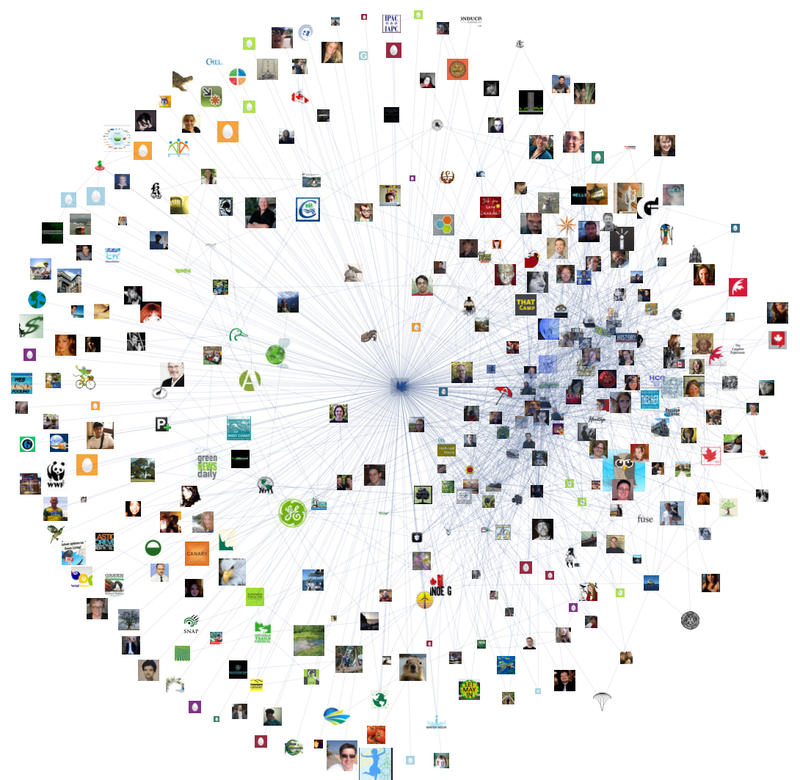 The vertices in this graph represent NiCHE members and activities that we have sponsored. If a member participated in a particular activity, there is an edge connecting the two vertices. The color of each vertex represents a measure of network centrality. Here we have labeled the most central of our activities. Note that the conferences (especially Confluences 2007 and Climate History 2008) drew relatively large numbers of participants who did not attend other NiCHE activities. Participants in the summer field schools (CHESS), on the other hand, were much more likely to attend more than one of our activities. This suggests that our field schools do a better job of helping to constitute NiCHE as an ongoing entity than regular conferences would. This is consistent with reports that we have received from regular CHESS participants, especially new scholars. In April 2011, NiCHE had about 340 followers on the social networking site Twitter. Each vertex in this graph represents one Twitter user. The size of the icon is scaled according to the log of the number of followers that each user has. (In this case, the number of followers range from a handful to tens of thousands, depending on the user). The edges of the graph represent some of the connections between Twitter users who follow one another. This figure shows that the NiCHE Twitter audience includes a relatively dense network of scholars who identify themselves either as digital humanists or as Canadian / environmental historians or geographers. There is also a relatively large collection of followers who do not appear to have many connections with one another. Knowing something about who is reading our tweets enables us to gauge the degree to which our online knowledge mobilization activities are effective, and helps us think about targeting our messages to particular communities. For physical computing or amateur science projects, you often need to be able to get the output of a sensor or transducer into your computer. There are a lot of ways to do this with specialized data acquisition hardware and software. This method is pretty old school, and requires only a standard laptop and a handful of inexpensive electronic components. It may be appropriate if you are working in a relatively quiet environment and you don’t need to take a lot of samples per second. Just about any physical signal or measurement in the world can be converted into a fluctuating voltage, an analog signal. Most laptops have a built-in microphone, so if you can convert your voltage into an audible signal, you can use the microphone to digitize it. Once it is in digital form, you can then process the signal with any programming language. Here we’ll use Mathematica. The electronic side of the project is a very simple metronome (or tone generator) based on the 555 timer. It is a mashup of two circuits from Forrest Mims’ work, the V/F Converter on page 51 of his Science and Communication Circuits and Projects and the Audio Oscillator / Metronome on p. 22 of his Timer, Op Amp and Optoelectronic Circuits and Projects. 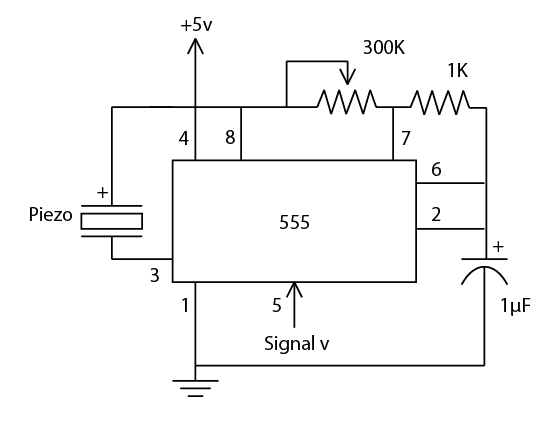 The changing voltage from a sensor or transducer is fed into pin 5 on the timer. For voltages between about 1.25v and 4.70v, the timer will respond with chirps or clicks that are more-or-less frequent: the frequency depends on the voltage. With lower voltages, the frequency is higher, and with higher voltages it is lower. The variable resistor can be used to tune the center of the frequency range. Increasing the value of the capacitor decreases the frequency and makes each individual chirp longer. Decreasing the value of the capacitor increases the frequency and makes each chirp shorter. For the test here, the variable resistor was set to 100K measured with a digital multimeter. The piezo element was rated for 3-20v, 10mA. You can make the circuit portable by powering it with a 9v battery, but you might have to adjust the values of the resistors and capacitor for best results. I used a bench power supply and proto-board for my experiments. To make a sample signal, I connected the signal line to a power supply set at 4.7v, decreased it by hand to 1.25v, then increased it back to 4.7v. The circuit responded by producing slower, faster and slower clicks. If you would like to listen to the recording, there are MP3 and WAV files in the GitHub repository. My original plan was to use the SystemDialogInput[ “RecordSound” ] command to record the audio directly into Mathematica, but that feature is unfortunately not supported on Macs yet. So I recorded the sample using Audacity instead, and then used the Import command to load the sound file into Mathematica. My complete Mathematica notebook is available for download on GitHub. Here are the highlights. 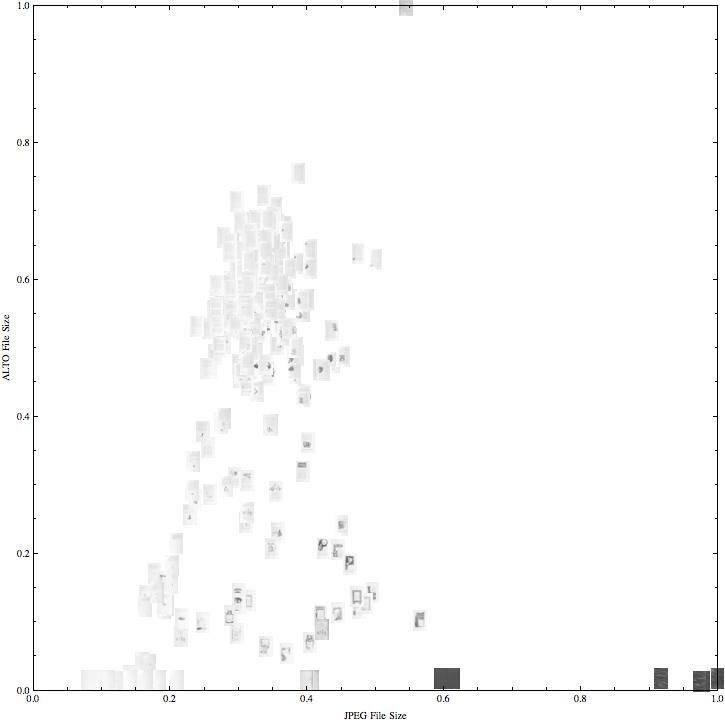 We load the signal in as data, and plot every thousandth point to get an idea of what it looks like. Since we sampled the sound at 44100 Hz, there will be 44100 data points for each second of audio, or 44.1 data points per millisecond. The duration of each click is on the order of 10 milliseconds or less, so we won’t be able to make out individual clicks this way. 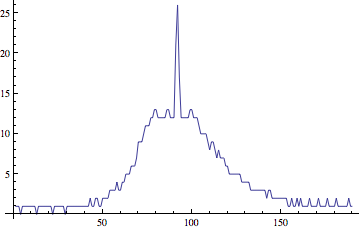 Near the beginning of the sample, the clicks are relatively sparse. If we start at the 3 second mark and plot every point for 50 milliseconds of our data, we can see one click. We are interested in pulling out the clicks, so we take the absolute value of our data, then use the MovingAverage command to smooth it a bit. Averaging over ten data points seems to give us a sharp peak. Now we can use a thresholding function that returns 1 when the signal is above a given level and 0 otherwise. We use Map to apply the function to each data point. This looks pretty good when the clicks are infrequent. We need to make sure that it will work in a region of our signal where clicks are more frequent, too. We look at a 50-millisecond-long region 10 seconds into our signal, doing the same processing and plotting the results. Since our thresholding looks like it will work nicely for our data, we can apply it to the whole dataset. Now we need to count the number of clicks that occur in a given interval of time. We will do this by using the Partition command to partition our data into short, overlapping windows. Each window will be 200 milliseconds long, and will overlap those on its left and right by 100 milliseconds each. To count clicks, we will use the Split command to split each window into runs of similar characters (i.e., all 1s or all 0s) then Map the Total function over each of the resulting lists. If there are more than, say, five 1s in a row, surrounded on either side by a run of 0s, we can assume that a click has occurred. We can now plot the number of clicks per window. This shows us that the voltage starts high, drops, then increases again. Note the spike in the middle, which represents a dense cluster of clicks. Looking at the raw signal, this appears to have been a burst of noise. At this point, we have a workable way to convert a varying voltage into a digital signal that we can analyze with Mathematica. For most applications, the next step would be to calibrate the system by recording audio samples for specific voltages and determining how many clicks per window was associated with each.